If you want to know if your Facebook data was shared by Cambridge Analytica, there's an easy way to find out. Beginning Monday, Facebook is notifying all 2.2 billion users about whether their data was harvested by Cambridge Analytica. Facebook will be sending out a detailed notification on Monday to the news feeds of the reported 87 million users who may have had their information shared by the political data mining firm. Cambridge Analytica is accused of using Facebook data obtained without users' knowledge or consent in order to sway the 2016 presidential election. The company provided screenshots of messages users will find at the top of their news feeds starting Monday. Users whose information was not shared by the company will see the message on the left below. If your information may have been harvested, you will see a message similar to the one the right. Facebook released sample screenshots of how it will notify users about whether their information was shared by Cambridge Analytica and how to manage personal data. 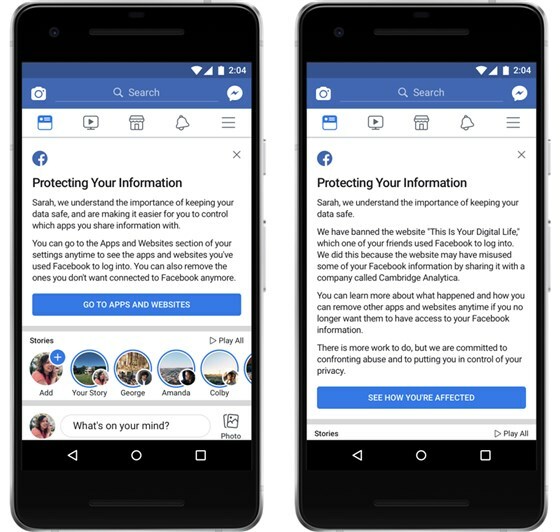 All of Facebook's 2.2 billion users will get a notification on Monday titled "Protecting Your Information" about how to see what apps and websites they have used Facebook to log into and how to remove apps they don't want connected to Facebook any more. More than 70 million of the affected users are in the United States, according to Facebook. Cambridge Analytica whistleblower Christopher Wylie told TODAY last month that the British company met with Trump's former campaign manager as well as former chief strategist Steve Bannon about influencing the election. Facebook COO Sheryl Sandberg admitted on TODAY last week that there is the possibility that additional breaches in personal information could be discovered by company audits in response to Cambridge Analytica’s misuse of user data. The company's CEO, Mark Zuckerberg, has apologized in the wake of the scandal and agreed to testify in a hearing before Congress on Wednesday about Facebook's privacy policies. For users worried about what personal information Facebook has gathered on you, this article outlines how to find that data and delete it.